24 cm xiv, 221 p. : ill. Originally published: Boston, Mass. : Houghton Mifflin, 1941. 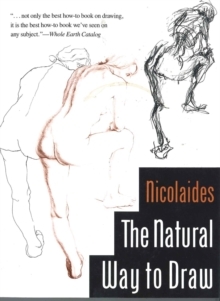 Concentrating on mastering the key concepts of drawing that will make a drawing come alive in his own, unique and perceptive, way Nicolaides focuses on teaching how a student can convey gesture and action, expression and feeling in their work. Consisting of 64 exercises that are intended to be studies over the course of a year, each section will develop earlier skills and is a constructive way for the student to begin to look at people and objects in a fresh way that will be the foundation of their drawing. Extensively illustrated with reproductions of the work of the Old Masters (including Raphael, Titian, Rubens) to the work of Van Gogh and Picasso, as well as the work of his students, which demonstrate the development a young artist can achieve through following this guide.